Atopic dermatitis is a familiar, often importunate skin disease that affects a huge proportion of the world’s population. 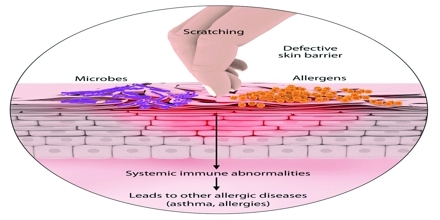 Atopic is a particular type of allergic hypersensitivity that is connected with asthma, inhalant allergies (hay fever), and a chronic dermatitis. The cause of atopic dermatitis isn’t recognized. But most people who have it have a personal or family history of allergies, such as hay fever (allergic rhinitis). The skin redness that causes the atopic dermatitis rash is considered a type of allergic response. Atopic dermatitis starts with dry skin that is frequently very irritated. Scratching causes the dry skin to become red and irritated (inflamed). Infection repeatedly occurs. Tiny bumps that look like little blisters may appear and ooze fluid or crust over. These symptoms-dryness, itchiness, scratching, and inflammation-may come and go. Over time, a recurring rash can lead to tough and thickened skin. Atopic dermatitis can be constant. You may need to try various treatments over months or years to control it. And even if you respond to treatment, your signs and symptoms may return (flare). It’s important to recognize the condition early so you can start treatment. Atopic dermatitis can be principally stressful, frustrating or embarrassing for adolescents and young adults. It can interrupt their sleep and even lead to dejection. 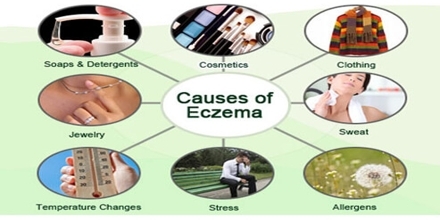 Children are more likely to develop eczema if a parent has had it or another atopic disease. If both parents have an atopic disease, the chances increase further. And close family members of people with this situation may face financial, social and emotional problems.